When Clarissa and I hiked Harney Peak last year, we encountered a few groups that were blasting music, sending text messages, and even one individual talking on the phone via his bluetooth headset. We came across a couple people with headphones in their ears, or their eyes locked on screens. They were on the trail to Harney Peak, but they weren’t on the trail. Their minds were elsewhere. Physically they were hiking. Mentally and emotionally, however, they weren’t present. I try not to judge too harshly, I use my phone a lot too. 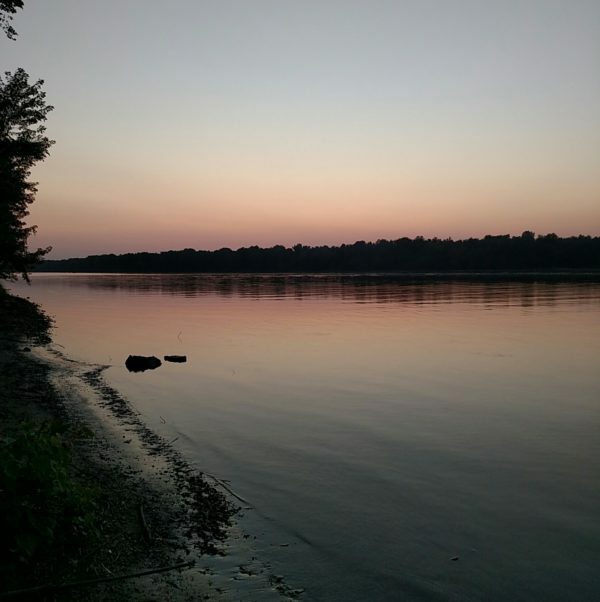 Whenever I go solo camping, like my December trip to Yellow River State Forest or my recent stay at Sand Ridge State Forest, I always take my phone with me. I’m out there alone, and even though I’m not doing anything wild and crazy, it’s important to have a lifeline just in case something goes wrong. Like many people, I also use my phone as my primary camera, so it gets a lot of use during various trips and activities. I may even post the occasional photo on social media while I’m on my outings. All that being true I try to limit my phone use when I’m camping, hiking, or having a new experience. Because I want to be present for that experience. I don’t just want my body to be in place, I want my mind there as well. We live in a world where it’s easy to have our minds elsewhere. We worry about work, we fear missing out, we compare our lives to fictional narratives, and we stress about all manner of things. Sometimes we can get so caught up in our own heads that we don’t even realize what’s happening around us. Have you ever gone out for the night, taken a vacation, or even just had a day off and spent it thinking about everything else in your life? Relationships, work, finances, politics… The list goes on. How can we shut off our mind so that we can actually enjoy the things we do, like taking a hike, a long bike-ride, or a night in the woods? Think about where you are, who you’re with, and what you’re doing. Enjoy the experience. Take your headphones out; listen to the birds and the breeze, or the waves and the wind. I can assure you that the playlist or podcast will be still be there when you get home. The experience, however, may be transitory, so don’t let it pass you by. I love to share what I’m doing, obviously. That’s kind of what I do here. The experience, however, should always be more important than the story. Our online presence makes it easy to lose sight of that. There’s nothing inherently wrong with social media; I’m an avid user myself. But it’s important to balance the desire to chronicle an experience with actually living the experience. It’s fine to take a photo of a scenic view, crashing waves, or even of yourself out in nature, just be sure that you’re spending your time enjoying these experiences, not simply documenting them. Don’t worry about how you’ll describe something, what hash tags to use, or how many “likes” you can get. Whatever adventure comes next, make sure that you’re truly living that experience. Don’t think about work, worry about money, or think about how to share the moment online. There will be plenty of time for all of that later. Just be present. You are completely right, balance is the key! I need a reminder of this as much as, if not more than, anyone else. But I try to strive for balance and moderation in my life. You’re spot on Wade. I don’t always take my cameras or sound kit with me on a walk but I always have my phone. I use it for taking photographs, sometimes for sound recording and occasionally for gps or the altitude app. Unfortunately having my phone with me also means messages, calls and notifications can also get through which is why a real break for me is one where there is no phone reception. I usually keep my phone on silent when I’m out and about, which helps a lot. I also don’t enable most push notifications. Things like e-mail, or most social media, I have to go seek out instead of getting notifications. It’s helpful for when I want to avoid those distractions, but I can easily access them if I so desire. A very good point Wade – if only I could remember to do that before the phone goes off while I am recording. The number of times I’ve done that is ridiculous. When I have remembered (once in a blue moon) to prepare my phone in that way, I then forget to put it back to normal when back at home. Am I a lost cause do you think? A photography instructor once said “Don’t forget to pet the whale.” The reference was being on a shoot where the whales came right up to the boat to have their barnacles scratched, and as a photographer he was inclined to take photos rather than enjoy the whale. He made much the same point you did. On the other hand, sometimes photography can push you to be even more present – to look at things more closely (macro) or from a different angle than you might otherwise. Maybe another way to look at it is, don’t become too detached to really appreciate your situation. Michael and I often leave our phones in car when we hike, but I do always bring my camera. Posting to social media and all that… we put on hold until we’re off the trail, though he has taken the occasional phone call from his mom, and I have replied to messages while I waited for him to hang up. But that’s about it.